Dubbed "the Gateway to Yellowstone National Park," the town of West Yellowstone, Montana has always found itself serving as an amazing nexus point for travel and outdoor adventure. Despite its relatively small size — the town boasts just over 1,300 permanent residents — it is a busy hub for travelers looking for active escapes in Big Sky Country at any time of the year. If you're planning on visiting the region and are looking for adventurous things to do outside of Yellowstone itself, we have some suggestions that should keep you busy. With that in mind, here are our favorite things to do in West Yellowstone. While there are more than 900 miles of hiking trails inside Yellowstone National Park, some of the best hikes are actually found outside its boundaries. West Yellowstone is a perfect example of this, offering fantastic trekking routes that are often much less crowded than the trails located within the park itself. If you want to hike like a local, head out to the South Teepee Creek Road Trail for nearly 14 miles of very scenic and secluded walking. The route features an elevation gain of more than 1,550 feet, making it an outstanding workout too. For something a little shorter, take the 4-mile out and back hike to the top of Horse Butte Lookout Trail, which offers some outstanding views of the surrounding countryside as a payoff for its 450 foot climb, which features a 40-foot fire tower to really take things to the next level. The wildlife around West Yellowstone is abundant and there are always opportunities to spot a wide variety of creatures, including elk, moose, deer, fox, marmot, and any number of other species. But for a guaranteed close encounter with the local fauna, be sure to drop by Grizzly and Wolf Discovery Center. Located right in town, the center gives visitors a chance to safely observe grizzly bears and wolves in a natural setting. The GWDC is open year round, 365 days a year, which means you can see these animals — and others — no matter when you visit West Yellowstone. And even if you do manage to spot these elusive animals inside Yellowstone National Park, you'll still never get as close as you will at this amazing wildlife refuge. A visit to the GWDC is a fantastic experience for animal lovers and children alike, making it a must-do option for travelers of all ages. While Yellowstone National Park has hundreds of miles of trails inside its borders, none of them are open to mountain biking. Fortunately, West Yellowstone is surrounded on three sides by the Gallatin National Forest, which offers even more trails that riders can explore from the seat of their bike. Drop by Free Heel and Wheel to rent a bike while in the area and you'll also get plenty of advice on where to ride. For instance, Sheep Creek Trail is an excellent 10-mile out and back route that will test a rider's legs with its initial climb, but the payoff is an incredibly scenic lake tucked away in the mountains. Or, if you're looking for something longer, try the Mile Creek Trail, which despite its name is actually 7 miles in length, but connects up with the Great Divide Trail system for even more possibilities. Centrally located on the Gallatin and Madison Rivers, West Yellowstone is an excellent place to go whitewater rafting, particularly in the late-spring and early-summer just after the winter melt off. Things can get wild out on the water at those times of the year, although the rafting remains excellent throughout the summer as well. Geyser Whitewater Expeditions is located a short drive from West Yellowstone and leads some of the best rafting excursions in the area. The company offers half and full-day river trips during the rafting season, with options for everything from an easy float to full Class III and IV rapids when the Gallatin is running fast. If you're looking for an activity guaranteed to get your heart pounding, this will definitely do it. Camping inside Yellowstone National Park is fantastic, but often those campgrounds can be crowded and difficult to get a reservation at, especially during the peak summer travel season. West Yellowstone has a number of excellent campsites available just outside the park, which only serves to enhance its ability to serve as a hub of adventure for those visiting the area. The Hebgen Ranger District offers dispersed, backcountry camping options within the Gallatin National Forest. This areas includes some fantastic places to pitch a tent, including the Baker's Hole Campground, Beaver Creek Campground, Cabin Creek Campground, Lonesomehurst Campground, and Rainbow Point Campground. All of those locations can be found close to town and are a short drive from the park itself. Any visit to Montana is sure to conjure images of the film "A River Runs Through It," but you don't have to be Brad Pitt to go in search of trout in West Yellowstone. The town sits right at the heart of some of the best fishing in the entire U.S., with opportunities to get your line wet all year long. With the Gallatin and Madison Rivers running nearby, there are numerous fishing holes to discover throughout the area. To get a leg up on the fish however, you'll want to drop by Arrick's Fly Shop, where you'll not only be able to get geared up for your angling adventure, you can also get the latest intel on where and when the fish are biting. The staff there can recommend the best flies for each season and can offer insights on what has worked for them at any given time of year. Whether you're a complete beginner or a seasoned pro, you'll find that the fly fishing in West Yellowstone is second to none. Try Cross-Country Skiing on Some of the Best Trails in the U.S. The outdoor adventures in West Yellowstone aren't confined to just the warmer months of the year as the town is one of the best winter playgrounds in the US. as well. The region gets an average of 200 inches of snow each year, which means it is a fantastic destination for those who enjoy cold weather excursions. 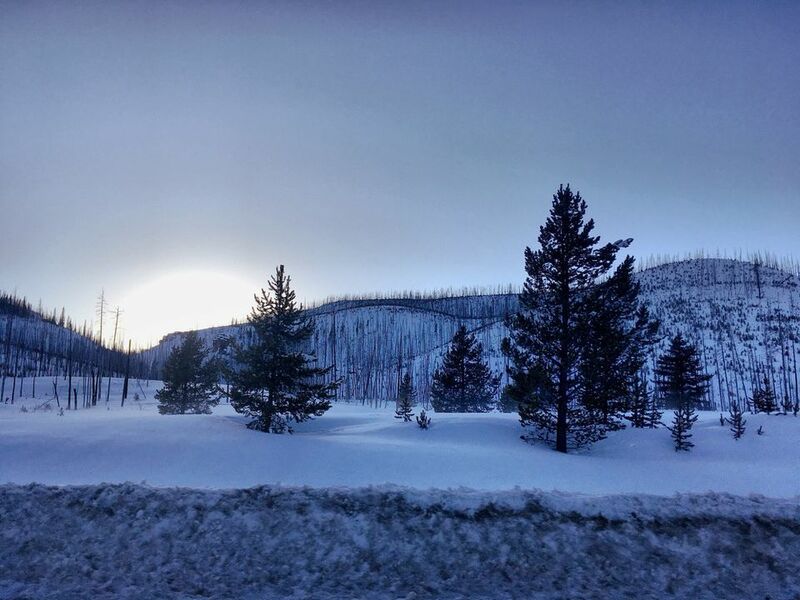 One of the more popular local activities is cross-country skiing, and West Yellowstone is blessed with some fantastic trails for those who enjoy the sport. In fact, the U.S. Biathlon team trains nearby, honing their skills for international competitions. The rest of us will be content with gliding along on the Rendezvous Ski Trails, which offers more than 20 miles of backcountry routes lined with lodgepole pine forests that are interspersed with the occasional wide-open mountain meadow. The Boundary Ski and Snowshoe trail is another great option, and accessible directly from town. It offers a shorter 5 mile long excursion, but is a great place to spot wildlife along the way. If there is a winter sport that rivals cross-country skiing in West Yellowstone it is probably snowmobiling. With more than 400 miles of trails to ride, the region has a lot to offer those who prefer their snow sports to be motorized. Whether you're a beginner searching for easy, groomed trails to cut your teeth on, or you're a grizzled veteran looking for challenging backcountry terrain, West Yellowstone has you covered. In fact, it is so much a part of the culture in the town that it is not uncommon to see snowmobiles zipping down the street alongside the regular traffic. There are so many great trails to ride nearby that it is tough to single out just one or two. That said, the Madison Arm Loop is a good place to start for those looking for a gentler experience, while the Two Top Trail is fantastic for the more adventurous riders. You can even ride inside Yellowstone National Park itself if you'd like, but its best to book those excursions well in advance. You can rent snowmobiles and sign up for a guided tour with Back Country Adventures. You didn't think we'd create a list of the best things to do in West Yellowstone without mention the national park itself, now did you? The town serves as a fantastic staging ground for anyone planning on spending time in Yellowstone itself, which as the world's first national park has a lot to offer travelers. The spectacular landscapes and wildlife found there are second to none, as are the hundreds of miles of hiking trails, numerous camping grounds, and the countless geothermal features spread out across the park itself. Yellowstone is one of the most visited national parks in the entire U.S., and for good reason. If it remains on your list of places to visit, then using West Yellowstone as your base of operations is a great way to enjoy everything that the region has to offer.